When we think of our countryside we always think of cows in fields. Cows have been part and parcel of our lives since we were children but they go back much further than that. They occupy a unique role in our history and have been domesticated since at least the early Neolithic age. Early Neolithic populations who domesticated cattle as well as goats and sheep, they believe, would probably have processed milk into cheese, yogurt and butter prior to consuming it. This shows the intrinsic and special part cows have played in providing food for our survival throughout history. According to archaeological and genetic evidence, wild cattle or aurochs were significant enough for Palaeolithic hunters to draw them in cave paintings in places such as those at Lascaux. I think when people realise the important part cows have played in our history and lives today its only right they get a Cow Appreciation Day. We might not get them a card or make them a cup of tea (they would supply the milk) but there are always other ways we can show our appreciation. Cows can’t talk and tell us themselves what they want but when we made our film recently of springtime cow turn out you could see the pure joy on their faces as they jumped and galloped around the field. They were happy to be outside on pasture and then content as they stretched out and relaxed. This is why one of our main standards for the Pasture Promise label is that cows graze for a minimum 180 days and nights per year. We believe that to call milk free range it should come from cows that spend at least half their lives outdoors. 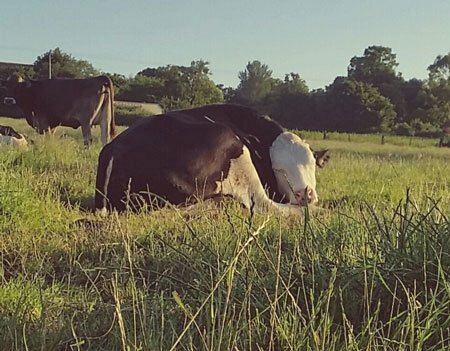 When you see pictures like this of a happy, relaxed cow deep in sleep you can see the important part being on pasture means to cows. If cows could speak they would say Thank Mooo for your appreciation by making the Pasture Promise and continuing support of the people and businesses who are bringing Pasture Promise free range milk to the wider communities. Please show your support and use #180days and #cowappreciationday.